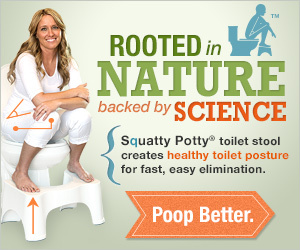 Comments Off on Squatty Potty – a FOOTSTOOL Fit for a CONSTIPATED KING? LOL! Even if you think you don’t need the Squatty Potty (as first seen on Shark Tank – and I loved that episode! ), you may change your mind after watching this informative and deliciously humorous video put out by the Harmon Brothers who took on the marketing campaign for the Squatty Potty! The “Squatty Potty Unicorn Video,” as it’s quickly becoming known, is not just humorous, but takes on a pretty serious subject – that of helping people understand why today’s toilets are not designed for the correct posture that we were designed to use when eliminating – and let’s face it… we all do it. The idea of showing a Unicorn pooping as the means of explaining the reason why squatting is a more natural way for the body to eliminate is completely brilliant! If you decide to buy the Squatty Potty after you have (hopefully) chuckled your way through this video, we’d love it if you’d buy it through our OFFICIAL Squatty Potty line here! Thank you! 🙂 (There was a 5-STAR Haiku Review on their Amazon listing that made us laugh: “Oh Squatty Potty – You fill me with endless joy – Yet leave me empty.”) Squatty Potty is proudly made in the USA!